Flame Core is a stage in Sonic the Hedgehog (2006) for the Xbox 360 and PlayStation 3. As with other levels in the game, it features in all three of Sonic, Shadow, and Silver's stories, although the characters fight their way through the area at different times and for different reasons. Along with Crisis City, Flame Core is part of a hellish possible future for Sonic's world. Set at least two centuries after the Day of Disaster, Iblis' dominion has transformed the world into a smouldering ruin. Flame Core features rivers of molten rock flowing across a ravaged, blackened landscape. What stable ground there is suffers contstant bombardment from volcanic bombs, while Iblis monsters rule the smoke-clogged skies. Below the surface, giant lava-caverns conceal luminous pink crystals amidst the fire-geysers and magma tubes. Mission: Find the Chaos Emerald! Although Team Sonic's search through Crisis City failed to turn up a Chaos Emerald, Tails at least recieves a signal indicating the presence of one of the gems in Flame Core. After meeting back up with Shadow and Rouge (giving the bat opportunity to taunt Knuckles about his sub-par treasure hunting skills), the five heroes embark on a journey through the smoking hellscape to find the Emerald. Sonic's journey has him running sideways along the walls above glowing lava rivers, before the hedgehog catapults into the caldera of an erupting volcano. After using this rather dangerous route to get underground, the player then controls Knuckles for a brief segment, using the echidna to glide around an interior chamber and activate five floating pink orbs to open the rock door. The action then switches back to Sonic, who delves further underground towards the Goal Ring. Unlike Team Sonic, Shadow and Rouge were actually successful in their search for a Chaos Emerald in Crisis City. However, they'll need at least one more to perform Chaos Control powerful enough to return to their own time. Shadow's route through the level is in fact exactly the same as Sonic's - the only differences come in the placement of objects and enemies (and Knuckles' substitution with Rouge). The Rashomon effect is in full swing during the boss, Iblis Phase 2, with Shadow defeating it single-handedly in his story while Sonic does the same in his playthrough. After opening the portal back to Soleanna, however, Shadow voids his return ticket to fight a second consecutive boss, Mephiles Phase 1. Silver's story comes full circle in Flame Core, his final level. 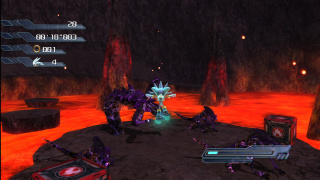 Although Sonic's just dived into the past to save Elise and thus avert the Day of Disaster, Silver and Blaze return to the fire-future anyway for a final battle with Iblis (implying, perhaps, that like Solaris itself, Iblis is transcendental and has to be defeated in multiple timeframes). The level for Silver includes a number of instances where the hedgehog must use the psychokinetic 'pads' to raise rocky spires out of the lava in order to procede. Inside the volcano, Silver takes a different route from Sonic and Shadow, entering a circular hollow where he's pitted against an immense floating cinder. Periodically throwing off fiery wakes, the firey orb requires Silver to cower behind rock walls until it's safe to proceed. Eventually landing on the ball itself, Silver must use sustained psychokinesis to extinguish it's flames, at which point the orb collapses. Picking himself out of the steaming wreckage, Silver then proceeds to the Goal Ring.